The recent U.S.-Mexico-Canada Agreement will preserve market access conditions for Canadian exporters while lifting uncertainty around business investment. There are, however, other trade tensions to monitor for Prairie businesses. The U.S.-China trade dispute is projected to slow the growth of the world economy, according to the International Monetary Fund, yet the 3.7 per cent growth forecast for 2019 global gross domestic product (GDP) suggests a robust demand for food and agriculture commodities. Keep an eye on whether U.S.-China tensions can be eased in early 2019. Status quo or an escalation, both are bound to have U.S. producers and agribusinesses adjust their production plans and indirectly impact Canadian agri-food markets. Trade barriers and tariffs on Canadian pulse exports to India, and steel and aluminium exports to the U.S., are other relevant disrupters to monitor. Projections for growth in Canadian GDP remain above two per cent for 2018 and 2019, driven by stronger exports and business investment than recorded in 2017. Consumption spending is projected to grow at a more moderate pace, slowed by five increases in the overnight rate of the Bank of Canada in the last 18 months. The bank will look to bring its overnight rate towards its ‘neutral level,’ estimated to be between 75 and 175 basis points higher than it was at the end of November. Don’t expect to see the pace of rate increases accelerate, given wage growth is slowing and inflation is slowly returning towards the bank’s target. Yet, higher interest rates are on the horizon. Preliminary estimates of U.S. GDP growth for the third quarter of 2018 suggest a robust U.S. economy driven by strong consumer spending. This is not surprising considering the unemployment rate is the lowest it has been in 49 years. Long-awaited wage growth is finally occurring in the U.S.: Wages grew at the fastest pace of the last 10 years in Q3. Strong economic expansion was also driven by higher inventories that will likely be a drag on economic performance in the following months. So, expect the U.S. economy to grow at a more moderate pace in 2019. Higher wages are supportive of U.S. household disposable income, which is positive for Canadian food manufacturers, considering the U.S. accounts for 75 per cent of our food exports. The Loonie will remain under 80 cents, boosting the competitiveness of Canadian exporters. The outlook for the U.S. farm sector is not as encouraging. The U.S. Department of Agriculture recently projected that net farm cash income will decrease $12.4 billion USD (or 12 per cent) in 2018. This would be the lowest level recorded since 2010. Rising interest rates are causing the balance sheet of U.S. producers to deteriorate. While the U.S. administration rolled out a financial aid package to compensate producers for the negative impacts of the U.S.-China trade spat, it did not address broader challenges related to weakening commodity prices. The 2018 supply of corn and soybeans could reach record-high levels and livestock production continues to climb, making it unlikely prices will rebound and lead U.S. producers towards broad profitability. The U.S.-China trade relationship will help determine the health of the 2019 U.S. farm economy. Profit margins of Canadian grain and oilseed producers are expected to be tighter in 2018 because of variations in yields and quality across the Prairies due to weather. Livestock profit margins have also been challenging. Hog production margins dropped significantly in August-September 2018 due to U.S. trade tensions with China and Mexico, while high feed prices have been putting pressure on cattle margins. Hog prices have now rebounded due to outbreaks of African Swine Fever in China and Europe. Rising interest rates and steady — or possibly weaker — farm cash receipts in 2018 are likely to moderate farm equipment purchases in 2019. Food manufacturers continue to record strong growth in revenues, although sales have slowed in the last 12 months so inventories have climbed, reducing capacity utilization in some food manufacturing sectors. Implementing the Comprehensive and Progressive Agreement for Trans-Pacific Partnership in 2019, coupled with the European agreement, will help Canadian exporters overcome volatility in the global marketplace and increase sales. Agricultural and food production is growing in many parts of the world. Trade impediments remain, yet the most positive trend is the strength of the demand for Canadian agricultural commodities and food at home and abroad. 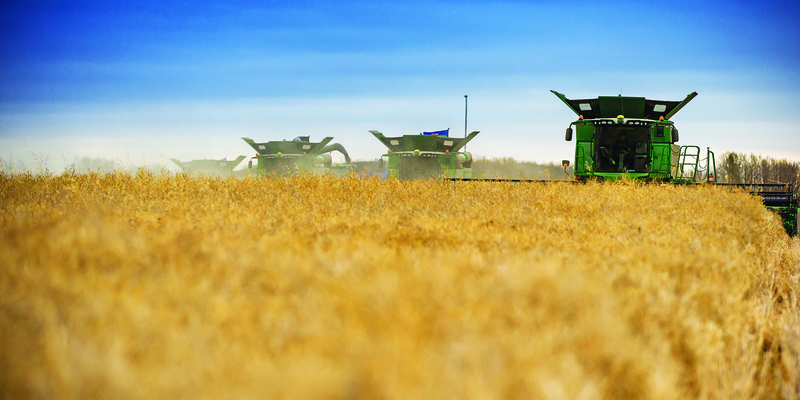 Canadian agribusinesses and food manufacturers can succeed in these conditions; however, higher interest rates, production cost inflation, and volatility are possibilities that should be carefully considered from a risk management standpoint. J.P. Gervais is the vice president and chief agricultural economist at Farm Credit Canada. He obtained his Ph.D. in economics from Iowa State University in 1999. Gervais previously served as president of the Canadian Agricultural Economics Society and as the Canada Research Chair in Agri-Industries and International Trade at Laval University.